In the previous article (http://ponnadi.blogspot.in/2012/11/archavathara-anubhavam-emperumanar.html) we enjoyed emperumAnAr's archAvathAra anubhavam. Let us now move on to see how kUrathAzhwAn enjoyed archAvathAra emperumAns. kUrathAzhwAn was one of the most confidential sishyas of emperumAnAr. 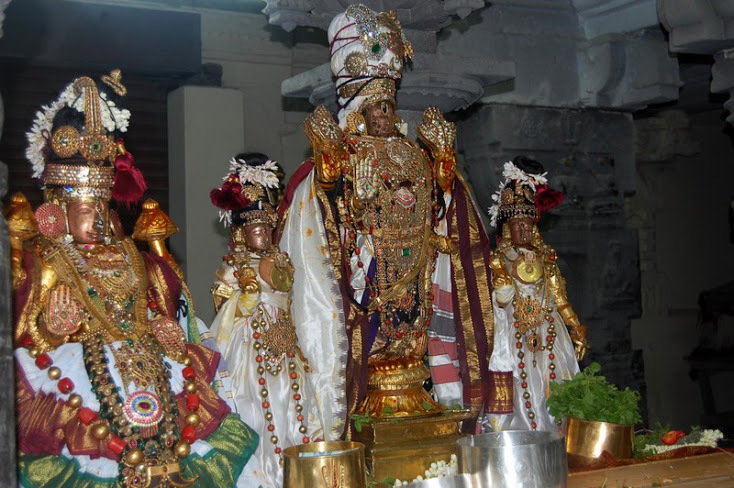 His jnAna, bhakthi, vairAghyam are well known and is the most glorified AchAryan in our sampradhAyam. thiruvarangathu amudhanAr is a direct sishya of AzhwAn. It was AzhwAn who slowly reformed amudhanAr and made him a sishya of emperumAnAr. 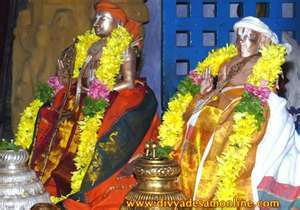 amudhanAr had great devotion towards AzhwAn since he established the relationship with emperumAnAr. In rAmAnusa nURRanthAdhi, he was able to glorify emperumAnAr so much, but while trying to glorify AzhwAn, he was completely lost for words. AzhwAn's glories are not within the boundaries of words. He was the one who is free from pride that arises from having knowledge, wealth and high birth. 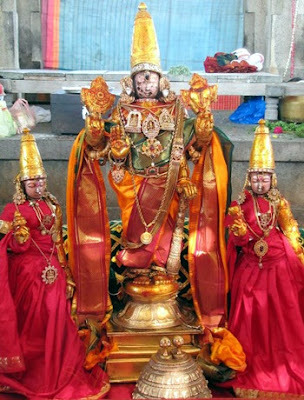 After getting his thiruvadi sambandham of AzhwAn I will no longer spend my time in anything other than glorifying emperumAnAr's divine qualities. He is the best example for being a sishya since when emperumAnAr was upset with him once, AzhwAn said that "since I am completely subservient to emperumAnAr I have nothing else to do that accepting what he does". He showed how a sishya should be totally surrendered to his AchArya. He is the best example for being an AchArya since when emperumAn was very angry with nAlUrAn who committed apachAram to AzhwAn, AzhwAn argued with emperumAn and requested that "He should get the same paramapadham which I will". He showed how an AchArya should be full of krupai even to the ones who committed apachArams towards him. 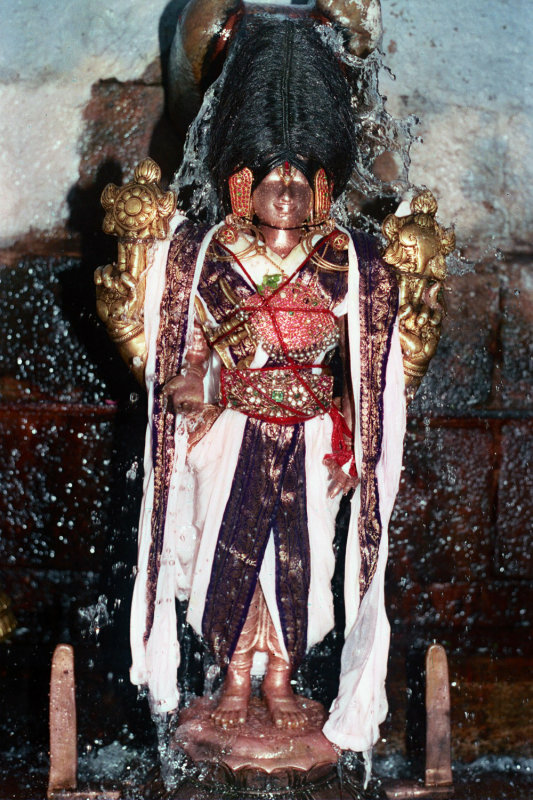 mAmunigaL also follows in the foot steps of amudhanAr and glorifies AzhwAn in his yathirAja vimsathi 14th slOkam. Oh rAmAnjuA! I am the beholder of all humility (and bad qualities) observed by kUrathAzhwAn whose glories are not within the boundaries of words. Because there is no one who is lower than me, your mercy (which will lift anyone up) is the only hope for me. In AzhwAn's thanian it is said that AzhwAn's srIsUkthis (sthavams) are like mangaLa sUthram for vEdham since without them it is difficult to establish the supremacy of emperumAn easily. In srIvachana bhUshaNa dhivya sAsthram, piLLai lOkAchAryar shows us in sUthram 274, how a sishya should be. In that he says "vasthavyam AchArya sannidhiyum bhagavadh sannidhiyum" (வஸ்தவ்யம் ஆசார்ய ஸன்னிதியும் பகவத் ஸன்னிதியும்) - this means sishyan's residing place should be either AchAryan's place or emperumAn's place. In the vyAkyAnam, mAmunigaL shows that only when there is no opportunity to be with AchAryan, the sishya should go to emperumAn's place. This we can see from AzhwAn's charithram. AzhwAn gave up everything (all his huge wealth) and surrendered to emperumAnAr and lived with him. When the saiva king wanted to establish shiva parathvam, AzhwAn went to the king's court (in place of emperumAnAr) and emperumAnAr left to thirunArAyaNa puram. AzhwAn eventually establishes vishNu parathvam and when the king orders to pluck his eyes, AzhwAn himself plucks his eyes saying he would no longer want to see anyone with the same eyes that have seen this king. After that due to his age factor and the effect of the lost eyes, he was unable to travel much, so he decides to stay in srirangam. Once when he went to periya kOil, at the entrance, the door keeper does not allow AzhwAn inside saying he is related to emperumAnAr (as the king has ordered anyone related to emperumAnAr should not be allowed inside the temple). Another door keeper says that AzhwAn is full of good qualities so he should be allowed. Hearing this AzhwAn at once says, all his good qualities are acquired after him surrendering to emperumAnAr and those qualities are not worth if they are brought up without the relationship with emperumAnAr. He decides to go to thirumAlirunchOlai and stay there for some time. It is on the way to thirumAlirunchOlai, he compiles athimAnusha sthavam and srivaikunta sthavam (glorifying emperumAn during separation from AchAryan). After reaching thirumAlirunchOlai, he glorifies azhagar's beauty in sundharabhAhu sthavam and prays to azhagar that he becomes reunited to emperumAnAr and also prays for the return of good times at srirangam. So, we can see that AzhwAn stayed with AchAryan and served him in his presence and only in his AchAryan's absence he went to emperumAn and glorified him. Let us now enjoy how AzhwAn enjoyed sundhara bhAhu emperumAn in sundhara bhAhu sthavam. 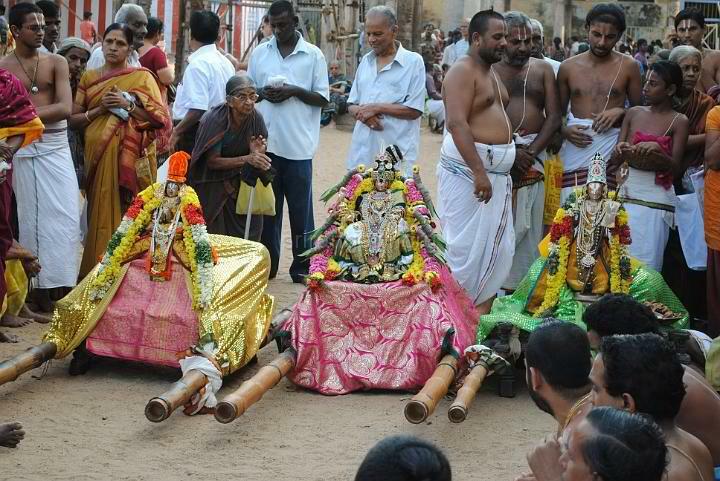 AzhwAn enjoys the beauty of azhagar's shoulders in 4 slOkams (51 to 43). NAchiAr thirumozhi - 9.1 - "maNtharam NAtti anRu madhurach chARu konNda suNdharath thOLudaiyAn" (மந்தரம் நாட்டி அன்று மதுரச் சாறு கொண்ட ஸுந்தரத் தோளுடையான்) - emperumAn churned the ocean and took the nectar. periya thirumozhi - 6.1.2 - "vinNnNavar amuthunNa amudhil varum penNnNamudhunNda perumAn" (விண்ணவர் அமுதுண அமுதில் வரும் பெண்ணமுதுண்ட பெருமான்) - While the dhEvas took the ordinary nectar, emperumAn took the real nectar which is pirAtti. periyAzhwAr thirumozhi - 4.2.6 - "EviRRuch cheyvAn EnRethirNthu vaNdha mallarai chAvaththagarththa chANthanNi thOL chathuran" (ஏவிற்றுச் செய்வான் ஏன்றெதிர்ந்து வந்த மல்லரை சாவத்தகர்த்த சாந்தணி தோள் சதுரன்) - kaNNan emperumAn defeated the wrestlers without any difficulty - even the sandal wood paste on his chest did not get disturbed a bit. In this slOkam, AzhwAn enjoys the bravery of azhagar's shoulders. He says that a brave man's shoulder will be easily identifiable with marks of bravery on the shoulders. He also says that the shoulders look like karpaka tree (kalpa tharu) and they have taken a vow to give whatever is requested by any one. This slOkam reflects thirumangai AzhwAr's thiruneduNthANdatam pAsuram 6 - "alampuriNdha NeduNthadakkai amarar vENdhan" (அலம்புரிந்த நெடுந்தடக்கை அமரர் வேந்தன்) - the lord of nithyasUris who has beautiful long hands that gives giving to the ones who ask him. In this slOkam, AzhwAn enjoys the broad nature of emperumAn's shoulders. He says that emperumAn's shoulders are as broad as an ocean and sky and also they are as fresh as a garden. He says such emperumAn enjoys lying down on thiruvananthAzhwAn (AdhisEshan). In this slOkam, AzhwAn again enjoys the beauty of azhagar who is the leader of thirumAlirunchOlai malai. He says when emperumAn lifted gOvardhana giri, his shoulders were enthusiastic in lifting it and protecting his beloved devotees. Also, when dhEvas and asuras gave up on the churning the ocean, emperumAn took that up on himself and churned the ocean. It is also said, even though they were thinking that they were churning, it was emperumAn who was churning the ocean from the beginning. Finally when pirAtti appeared from the ocean, emperumAn's 2 shoulders became 4 and then became many out of great love to embrace her. In 2 slOkams (62,63), AzhwAn enjoys the beauty and glory of azhagar's thiruvadis (lotus feet). In this slOkam, he says the lotus feet of azhagar is more beautiful than the lotuses on which they are seated. This can be understood from the fact that, there is a norm where one person defeats another, the defeated person carries the person who defeated him on his head. This slOkam relates to NammAzhwAr's "thanNthAmarai chumakkum pAdhap perumAn" - (தண்தாமரை சுமக்கும் பாதப் பெருமான்) from thiruvAimozhi 4.5.8, meaning emperumAn's lotus feet are carried by cool lotus flower. In this slOkam, the same concept is explained in detail. azhagar's thiruvadi's beauty, tenderness, fragrance, taste of honey that flows, etc are much greater than that of a lotus. So, the lotus flower becomes the seat of emperumAn's thiruvadis and carries the thiruvadis on its head. Finally in slOkam 129, AzhwArn reveals his heart to azhagar emperumAn. Oh sundharabAhu who is an ocean of mercy! Please hear my prayers. Let me return to sriranga periya kOil to be under the lotus feet of emperumAnAr. Please bless me this favour. Thus AzhwAn enjoyed sundhara bhAhu emperumAn's divine beauty, the dhivya dhEsam itself, his qualities, emperumAn's avathArams, etc in sundhara bhAhu sthavam. He stayed in thirumAlirunchOlai for some time. While he was filled with sorrow due to the separation from emperumAnAr, he sustained himself by glorifying azhagar emperumAn. Finally, the saiva king died and both AzhwAn and emperumAnAr returned to srirangam. emperumAnAr on his return directly went to AzhwAn's thirumALigai and embraced AzhwAn. AzhwAn recites the 3 sthavams (athimAnusha sthavam, srI vaikunta sthavam and sundhara bhAhu sthavam) in front of emperumAnAr. emperumAnAr being very pleased with those and glorifies AzhwAn that it was his sthavams which brought back the lost glory to srirangam. He also tells AzhwAn that AzhwAn should sing a sthavam on dhEva perumAL who will bring his eye-sight back. AzhwAn first refuses saying that he is satisfied with the inner-vision (based on the knowledge given by emperumAnAr himself) and does not need the external eye-sight anymore. But since emperumAnAr insists, he ends up compilng varadharAja sthavam to fulfill his AchAryan's order. emperumAnAr wanted to present this to dhEva perumAL, so he travels to kAnchipuram with AzhwAn and requests AzhwAn to present this in front of dhEva perumAL. When AzhwAn completes the sthavam, for some reason, emperumAnAr is not near by. At that time, dhEvar perumAL asks AzhwAn for his desire, and AzhwAn instead of asking for his eye-sight simply asks "nAlurAn should get whatever I get (mOksham)" and emperumAn agrees to that. Hearing this emperumAnAr becomes really upset with AzhwAn since he did not fulfill his order of asking for the eye-sight and dhEva perumAL for not giving the eye-sight. dhEva perumAL again speaks to emperumAnAr and tells him that AzhwAn will now have the his eye-sight back to see emperumAn and emperumAnAr. emperumAnAr becomes really pleased with that. varadharAja sthavam is one of the most wonderful compilations which contains all the rahasya arthams of our sampradhAyam. It contains many in-depth meanings such as artha panchakam, emperumAn's supremacy, emperumAn's beautiful form and its descriptions, etc. Let us enjoy a little bit from this glorious prabhandham of AzhwAn. In the 2nd slOkam, AzhwAn glorifies dhEva perumAL's important qualities. I surrender unto dhEva perumAL who is sriya:pathi (husband of perundhEvi thAyAr), who is the limitless wealth for the ones who desire him, one has taken vow to give whatever any one asks him, one who is a well wisher of all living beings, one who worries for others sorrows and the one who is the leader of nithya sUris. In the 9th slOkam, AzhwAn enjoys dhEva perumAL's presence in hasthi giri in a beautiful way. brahmam which is wonderful, great and that has endless glories is incomparable to any one due to these stated reasons. That brahmam which has been glorified in vEdham, vEdhAntham, etc. The ones who studied sAsthram were doubting those glories, but as soon as they saw that same brahmam as dhEva perumAL on the top of hasthi giri, they fully agreed with the conclusions of vEdham, vEdhAntham, etc. Just looking at the thirumEni (form) of emperumAn, every one will be convinced with his supremacy. In the 25th slOkam, AzhwAn describes further what is explained in the 9th slOkam. Oh dhEvarAjA who is the crown jewel decorating the hasthi giri! Even if you dont want to reveal your supremacy, the lengthy crown on your thirumudi (head) is easily showing that you are the supreme lord. While your crown itself looks like a mountain, the divine stone on the top of the crown looks like the sun which is rising from the mountain. NammAzhwAr also glorifies emperumAn in thiruAimozhi 6.6.6 as "poRchudark kunRanna pUNdhanN mudiyarkku" (பொற்சுடர்க் குன்றன்ன பூந்தண் முடியர்க்கு) which means the same thing. In the 59th slOkam, Azhwan (while enjoying dhEva perumAL's thiruvadi) wonders which place fits/suits the glory of his thiruvadi. Oh varadha! Which place gives you the most pleasure for your thiruvadis, is it the dhahara AkAsam which is in the heart of bhakthi yOgis, is it the lotus flower which stays fresh always, is it the vEdhAntham, is it the thirumudi (head) of NammAzhwAr or is it the peak of hasthi giri? In the vyAkyAnam, kAnchi swamy has shown that this slOkam is very similar to periya thirumozhi 7.9.7 pAsuram where thirumangai AzhwAr questions emperumAn in a very similar way. "chEyOnGgu thanN thirumAlirunYchOlai malaiyuRaiyumAyA! enakkuRaiyAyithu maRai NAnginuLAyO! thIyOmbu kaimaRaiyOr chiRu puliyUrch chalachayanaththAyO! unathadiyAr manaththAyO! aRiyEnE" (சேயோங்கு தண் திருமாலிருஞ்சோலை மலையுறையுமாயா! எனக்குறையாயிது மறை நான்கினுளாயோ! 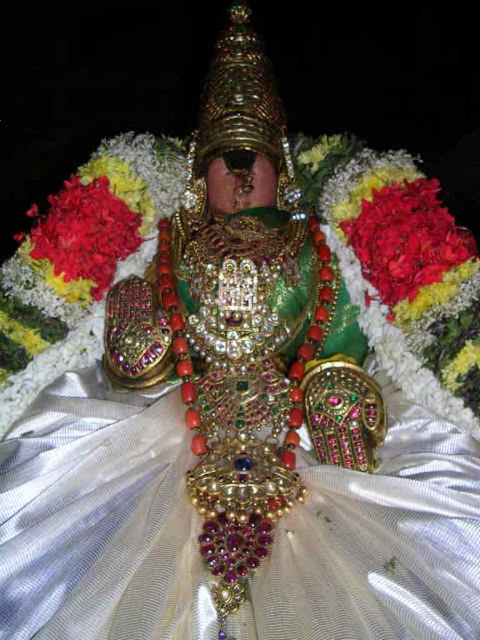 தீயோம்பு கைமறையோர் சிறு புலியூர்ச் சலசயனத்தாயோ! உனதடியார் மனத்தாயோ! அறியேனே). In the last slOkam, AzhwAn enjoys his vamsa paramparai and completes the sthOthram saying that he is qualified to be blessed by emperumAn due to his sambandham with our guru paramparai. Oh varadha! I am surrendered to emperumAnAr. emperumAnAr is surrendered to ALavandhAr, ALavandhAr to NAthamuNi, NAthamuNi to NammAzhwAr, NammAzhwAr to periya pirAtti. It is because of this sambandham I am qualified to be blessed by you. 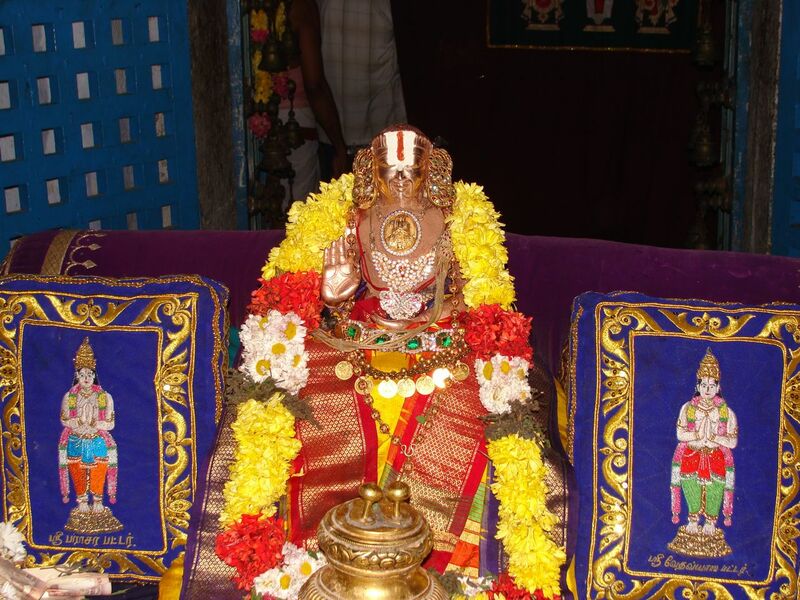 In the vyAkyAnam, kAnchi swamy shows from AchArya hrudhayam that "For prapannas, kulam/vamsam (family) is based on parAngusa, parakAla, yathivarAthigaL". The relationship in the guru paramparai between various AchAryas are beautifully shown in the vyAkyAnam as well. 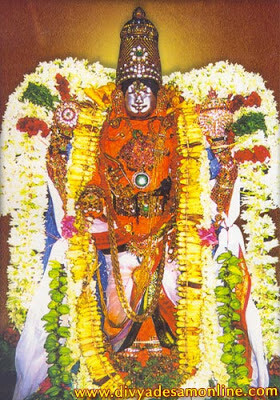 AzhwAn glorifies periya pirAtti in srI sthavam. In this prabhandham, there are only 11 slOkams. a very few selected places only, AzhwAn also glorifies emperumAn in 4 sthavams in more than 400 slOkams, but glorifies pirAtti in only 11 slOkams here. But, for prapannas who depend on pirAtti for purushakAram, these 11 slOkams are more valuable than the 400 slOkams of emperumAn. Here, in this sthavam, AzhwAn first shows his humility and gives an introduction in the first 5 slOkams and glorifies pirAtti in the next 5 slOkams. Let us see the last slOkam where many great meanings that are very much applicable to prapannas are revealed. When pirAtti glances her divine view/vision on any one for even a fraction of a moment they will become blessed. Such great periya pirAtti should give her blessings to me as well. kAnchi swamy shows in his vyAkyAnam that AzhwAn is not looking the usual lakshmi katAksham (wealth) which is requested by samsAris. Because AzhwAn was so wealthy but gave up everything before surrendering to emperumAnAr. He even threw the golden bowl which was carried by ANdAL and told her that he does not want to have any thing for himself. After that he became parama virakthar and performed unja vruthi (bikshai/begging that was sanctioned in sAsthram) for living. The katAskham he is asking for is "kainkarya srI". Like gajEndhrAzhwAn, vibhIshaNAzhwAn and iLaya perumAL (lakshmaNan) who were celebrated for their kainkarya srI, AzhwAn also prays for the same. When gajEndhrAzhwAn gave up all his self-efforts to protect himself and called out for emperumAn, he was glorified as "sa thu nAga vara: srimAn". When vibhIshaNAzhwAn, gave up rAvaNan and lankA rAjyam (basically giving up all his ownership) and left lankA to surrender to perumAL, he was glorified as "anthariksha gatha: srImAn". 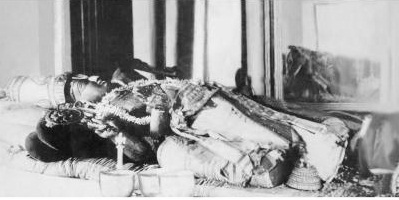 When iLaya perumAL gave up all the comforts and followed perumAL to vanavAsam, he was glorified as "lakshmaNO lakshmi sampanna:". It is also clear that without the purushakAram of pirAtti it is very very difficult to get this kainkaryasrI in both this world (for archAvathAra emperumAns) and paramapadham (paramapadhanAthan) as idenfied by AzhwArs in "panGgayaththAL thiruvaruLum koNdu Nin kOyil chIyththu", "pUvaLarum thirumagaLAlaruL peRRup ponnulagil polivar thAmE", etc. It can also be seen in chUrppaNakai charithram that ignoring pirAtti will only lead to losing emperumAn also. Thus we have taken a dip into the ocean of AzhwAn's archAvathAra anubhavam. There is endless bliss in it and this gives a starting point for us to engage in more such anubhavam. In the next article we will see parAsara bhattar's archAvathAra anubhavam.